Ionia, MI. 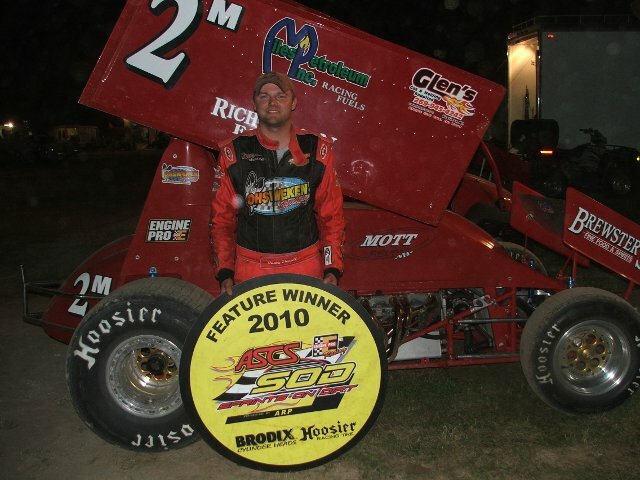 – (Friday July 23rd, 2010) – Dustin Daggett made history Friday night at the Ionia Fairgrounds with the Engine Pro ASCS Sprints on Dirt presented by ARP. Daggett scored the 71st ASCS SOD feature win of his career, tying him with the Hank Lower for the most feature victories in series history. Daggett set the record by completely dominating the Ionia Free Fair program sweeping the heat race, dash, and feature event victories. Bares then had to hold off repeated challenges for second from Grubaugh. Eventually Grubaugh made the pass,but Bares passed Grubaugh returned the favor down the backstretch to maintain second spot Another attempt at taking away second position cost Grubaugh third when Gregg Dalman took the position on the final lap. Daggett dominated the non-stop 25-lap feature. Bars, Dalman, Grubaugh, and Ben Rutan rounded out the top five. Rutan was the only driver other than Daggett to win an event during the evening, winning the second heat race. “A” Feature (25 Laps): 1. 2m – Dustin Daggett, 2. 91 – Joe Bares, 3. 49t – Gregg Dalman, 4. 00 – Ryan Grubaugh, 5. 23 – Ben Rutan, 6. 19 – Brett Mann, 7. 1- Sean Robinson, 8. 6n – Dain Naida, 9. 10x – Davey Brown, 10. 85 – Mike Daggett, 11. 22 – Aaron Shaffer, 12. 46 – Robert Huisken, 13. 14 – Ryan Davis, 14. 187 – Gavin Hunyady, 15. 70 – Jim Lingar, 16. 29s – Marques Huffer, 17. 8 – Tim Champlin. Click the link for this story to go to the Sprints on Dirt twitter page for frequent updates from the Ionia Free Fair event. 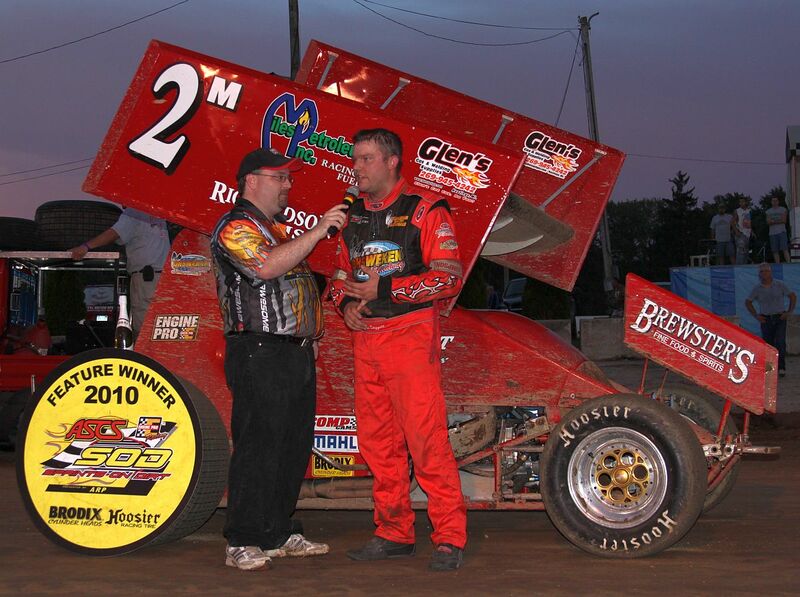 T.J. Buffenbarger, ROTHBURY, Mich. (July 16, 2010) – People in motor sports often say if you can’t win, be spectacular. Dain Naida managed to do both on the way to his second Engine Pro ASCS Sprints on Dirt feature win in as many weeks Friday at the Winston Speedway. Naida took the lead with a last lap pass of 2008 ASCS SOD champion Brett Mann and then slammed into a loose wheel off another competitors car with his top wing while crossing the finish line. Mann and Naida started on the front row for the 25-lap feature. Mann too the lead at the start with Naida pulling up to challenge going down the backstretch when Ben Rutan and Dustin Daggett made contact in turn two. Daggett spun and Rutan made contact after suffering front end damage. While under caution one of Daggett’s crewmembers came onto the racing surface, disqualifying him from the remainder of the feature event. Rutan’s crew was unable to make repairs. The second restart attempt saw Mann take the lead with Naida and Grubaugh in tow when the red flag appeared on lap three for a two car flip involving Ryan Davis and Joe Bares in turn four. Both drivers emerged from their cars uninjured. Mann pull away again after the restart, but Naida closed the gap as the race went on. Just as the lead duo was approached slower traffic Louie Carufel spun in turn two and in the ensuing craziness Trey Smith took a wild tumble off the track in turn one to bring out another red flag. Smith was uninjured in the incident. Carufel was able to restart. After the restart Mann opened up his largest lead of the feature, but Naida kept hanging as close to the infield marker tires as possible and began to makeup ground. Coming to the white flag Mann left just enough room on the bottom for Naida to slide under. Mann and Naida made contact coming off turn two, with Naida going into the lead. Just as it appeared Naida would have smooth sailing to the checkered flag Aaron Smith encountered problems right in front of Naida and lost the left front wheel off his car. Naida slammed into the wheel with his top wing while crossing the finish line to take the checkered flag ahead of Mann, Grubaugh, Gregg Dalman, and Davey Brown. Mann and Naida started on the front row for the 25-lap feature event. Rutan, Dalman, and Gary Fast won heat race events, Daggett while won the fast car dash. Total Seal Fast Car Dash presented by Gaerte Engines (4 Laps): 1. 2m – Dustin Daggett, .23 – Ben Rutan, 3. 49t – Gregg Dalman, 4. 10x – Davey Brown. From T.J. Buffenbarger, TULSA, Okla. (July 12, 2010) – The Engine Pro ASCS Sprints on Dirt presented by ARP continues the MAHLE / Clevite Short Track Challenge Friday and Saturday at the Winston Speedway and Crystal Motor Speedway. Friday will be the first appearance this season at Winston while Crystal will host the second of their three events this year. 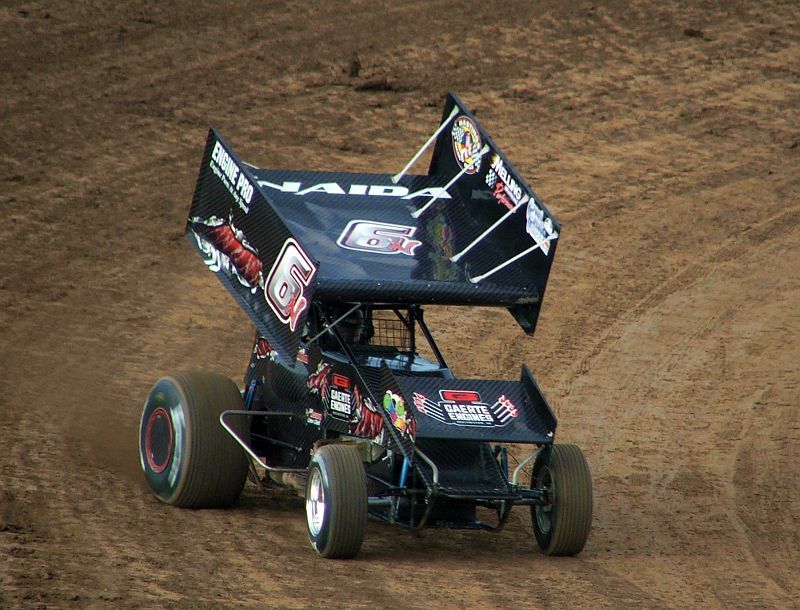 Dain Naida not only leads the Short Track Challenge standings, but tied for the lead in the overall ASCS SOD points coming off the victory last Saturday at Owendale Speedway. Before last Saturday’s Naida’s last ASCS SOD feature win came at Winston. Ryan Grubaugh will look to overcome a mistake during the feature that dropped him back into a tie for the point lead with Naida. Both Naida and Grubaugh will have to deal with Dustin Daggett returning to the circuit for both shows this weekend. Daggett once again is the leading feature winner in the series with three victories so far this season, one of which came during the season opener at Crystal. The Engine Pro ASCS Sprints on Dirt presented by ARP is in its 31st season of competition. 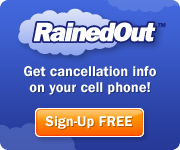 Twenty-seven races are on the calendar scheduled throughout Michigan, Indiana, Ohio, and Ontario. The American Sprint Car Series, in its 19th year of sanctioning Sprint Car racing events, brings the best of Sprint Car racing to nearly 100 different tracks throughout 25 states and Canada in 2009. Anchored by the Lucas Oil ASCS Sprint Car Dirt Series, ASCS also consists of several different regions throughout the nation.